I like the movie Field of Dreams, but it’s a terrible evangelism strategy for church planters. Most unbelievers have no interest in joining you this Sunday. Simply offering a “good product” isn’t enough in this post-Christian world. It doesn’t matter how cool your venue is, how good your music and coffee are, or how hip your pastor looks. But if a church is to flourish, evangelism must be central to the life of the body. In years past, two forms of evangelism have been most common: event evangelism and cold-call evangelism. Indeed, when people hear “evangelism” today, they often think of either big events/crusades or door-to-door outreach. The Lord has used both of these approaches, and in some contexts, they continue to be effective. However, in other places—particularly in many post-Christian contexts—these approaches are often less fruitful. I don’t want to insinuate we should reject these approaches. We shouldn’t. 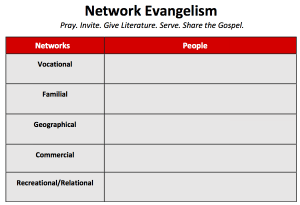 But I want to highlight another approach that has historic precedent—one that is both culturally appropriate and personally achievable: network evangelism. Network evangelism isn’t an event; it’s not a program; it’s not something you only do on Tuesday nights at 6 p.m. It’s a lifestyle. Network evangelism isn’t an event; it’s not a program; it’s not something you only do on Tuesday nights at 6 p.m. It’s a lifestyle. It’s about living with gospel intentionality in the everyday rhythms of life. It’s done among the people who fall into your current web of relationships. When planting a church, network evangelism becomes a practical way to emphasize how every member can live as a missionary. There must be an atmosphere of expectation that every member will always have two to four people in the incubator, a force-field in which people are being prayed for, given literature, brought to church or other events. We’ve sought to expand and build on this idea. Network evangelism first recognizes the sovereignty of God. It develops a mindset that every person in our sphere of life matters, and it helps us remember that God has us living in this time and place in history, surrounded by particular image-bearers he has sovereignly put in our path (Acts 17:26). Social networks are the basic mechanism through which conversion takes place. . . . Most conversions are not produced by professional missionaries conveying a new message, but by rank-and-file members who share their faith with their friends and relatives. . . . The principle that conversions spread through social networks is quite consistent with the fact that the earliest followers of Jesus shared many family ties and long-standing associations. . . . Although the very first Christian converts in the West may have been by full-time missionaries, the conversion process soon became self-sustaining as new converts accepted the obligation to spread their faith and did so by missionizing their immediate circle of intimates. Did you see that? The movement advanced because new converts accepted the obligation to spread the gospel within their own circles of everyday influence. Further, network evangelism promotes faithfulness and patience. Evangelistic methods often involve only “on the spot” presentations. They can be impersonal as well. They can be about generating numbers, not valuing people. They can allow us to simply “check a box” to appease our guilt, and then move on. In planting a church, network evangelism becomes a practical way to emphasize how every member can live as a missionary. Familial Network—people in your family. Geographical Network—people in your neighborhood. Vocational Network—people at your workplace. Recreational Network—people you hang out with. Commercial Network—people you see at shops. Invite them—Invite them over to eat dinner, to play sports, to go to a movie, to come with you to a church event. Serve them—Identify a way that you can bless those in your networks. Babysit for them, pick up groceries for them, cut their grass, and so on. Give resources to them—Ask them to read a book or article with you, or to listen to a sermon or podcast. Discuss these resources with them. Share the gospel with them—Look for various places where you can talk about your faith. Let your friend know you are part of a church, and see if they ask questions. Listen to their problems with real concern, and then seize the opportunity to address the problems with gospel hope. Share some of your own struggles, and talk about how you deal with them in light of your faith. Simply ask them what they believe, and just let them talk. May God use ordinary saints like us, who overflow with love for the Savior, to lead outsiders to faith as we live with gospel intentionality in our everyday networks.